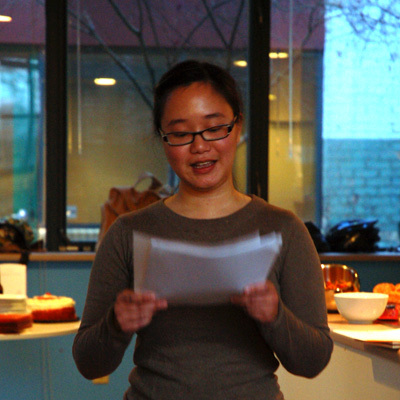 Last week, I had the privilege of attending a farewell reading for South Bend, IN based novelist, Lily Hoang. Lily received her M.F.A. from the University of Notre Dame in 2006, and has since been living in the area, teaching at St. Mary’s College, and furiously turning out new work. In 2007, her first book, Parabola, which won the Chiasmus Undoing the Novel Contest, was published, and in 2008, her novel Changing came out from Fairy Tale Review Press. She also has a chapbook (Mockery of a Cat) out with Mud Luscious and has three forthcoming full-length books in the pipeline: The Evolutionary Revolution (Les Figues Press, 2009/2010), Invisible Women (StepSister Press, 2010), and Unfinished (Jaded Ibis Press, 2012). Lily’s books are incisive, imaginative and form-bending. She plays with convention and elasticizes the boundaries of narrative and the space of the page in all sorts of ways. She’s also well-loved among the members of the Notre Dame Creative Writing community, and has served as a kind of de-facto mentor to many of the current M.F.A. students, so when she recently announced that she is moving to Canada at the end of the year, a couple of my cohorts pooled their resources to throw her a lovely goodbye reading.